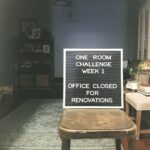 Here we are at Week 6 of the One Room Challenge. 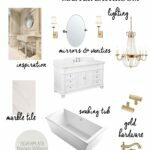 Last week, I alluded to the fact that, if and only if, we kept to a very strict timeline would our master bathroom makeover be ready for the big reveal day. On Sunday night, after tiling for 6 hours straight, my husband made me realize the very sad truth. I am a slow and methodical worker. I want my work to be precise and I want to produce a quality end product. Despite this realization, I committed myself to work as hard as I could to get as much done as humanly possible. It so troubled me to not make the deadline. Even before this realization, I had worked many long days and nights, more than I care to count, until at least 1 am in the morning. And as sad and disappointing as it is to not finish on time, I know I worked as hard as I could and maybe even pushed myself harder than I probably should have. My body says I did. After those few glamor shots, let’s take a peek into the reality of the project. 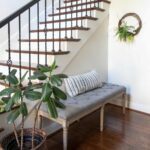 On top of the 4×12 tiles at the chair rail should be this beautiful marble crown molding. I had hoped to set these on Wednesday, but the plumbers took all afternoon to complete the few simple tasks left for them to do, longer than we had both anticipated. I had pushed them back from Tuesday so that I could get the tub area and part of the shower walls grouted. Check out that hole they had to cut in the wall to reset the poorly fitted plumbing from prep work done just a few weeks ago. At some point on Wednesday, when things were even less than I had hoped for, I reminded myself. This is a major renovation. Things rarely go as planned. Obviously, the shower walls aren’t complete and we still don’t the amazing rain shower head from Moen or the hand held shower. The sink walls have yet to been touched. The beautiful light fixtures from Lamps Plus didn’t go up because I’m not even close to finishing over here. I don’t think I ever shared the full details of what is planned on these walls. I will tell you this. It’s going to be epic. You will want to come back for the full reveal. If you are up for joining me for a Seventh Week, come back next Friday, November 20th for the full reveal. I am giving myself one extra day and one extra week to get it all done. Because tomorrow, I’m taking a much needed break. A break that includes cleaning house and doing laundry unfortunately. But at this point, those things sound really great to me. 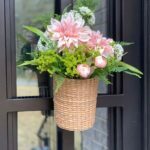 Thank you, to Linda at Calling it Home for hosting this this obviously crazy thing we all love, the One Room Challenge. Be sure to visit the other guest participants and see how they faired. I can’t wait to have some time to check them all out. Click here for the links. you don’t want to miss this reveal. A HUGE thank you goes out to all the wonderful companies who provided support for this makeover. Jeffrey Court Tile, Moen and Lamps Plus graciously shared their amazing products and I am very grateful. 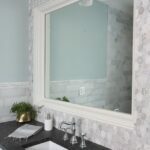 One Room Challenge: Tile is going down! I know how you feel. Last ORC I was trying to do a bathroom too. Honestly you got farther than me. I had the same issue where I didn’t get the showerhead too. But so far your bathtub is STUNNING! I love it. The whole thing is going to look amazing! Good Luck! Stunning! can’t wait to see the finished product. 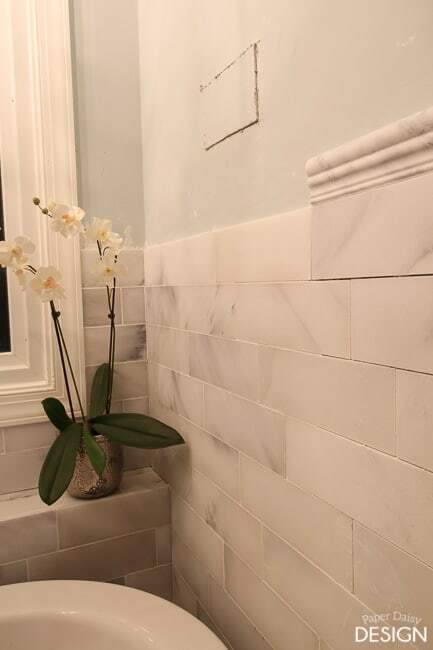 The tile that you have up looks gorgeous! That marble is lovely and I am so envious of how your shower will look when all is said and done. And selfishly I must say that I’m excited to continue to follow this project even after the ORC is over! Arielle, That is about the nicest thing I could have read this morning. I very much appreciate your words of encouragement and happy to hear you are willing to stick it out with me. See you next week! Thank you! I do hope you come back! Oh it is looking so stunning though!!!! Great job! It’s dreamy. Katy, It will be the bathroom of my dreams for sure. Sadly though, I am tiling in my dreams now. Honestly. I cut and lay tiles while I sleep for the last few nights. Insanity I guess! Thanks for commenting and I hope you come back to see the dream become a reality. 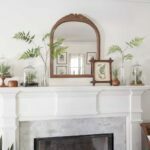 Oh wow – – It doesn’t even need to be finished to look amazing! That bathroom is absolutely gorgeous. You’ve done a fantastic job. Give yourself credit for what you’ve accomplished this far. Congrats! Teresa, Thanks for the words of encouragement! Yes! Take a BREAK, clean the house ( I can totally relate to that normally being the worst thing ever, but sounding like a break during the ORC). 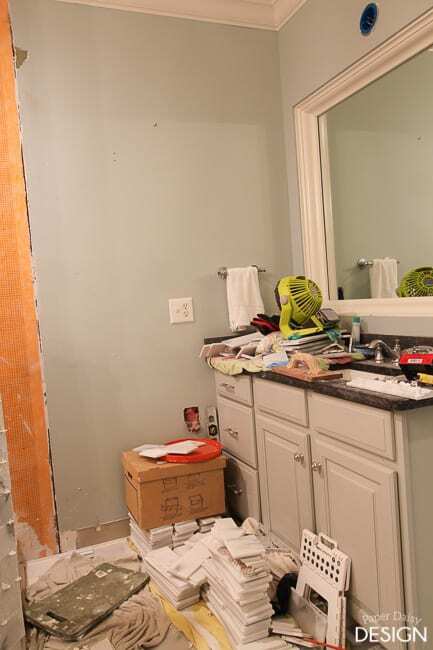 You got a LOT done and this bathroom will be so worth it. It would have taken three months without joining the challenge, so one extra week isn’t bad at all. Wow! 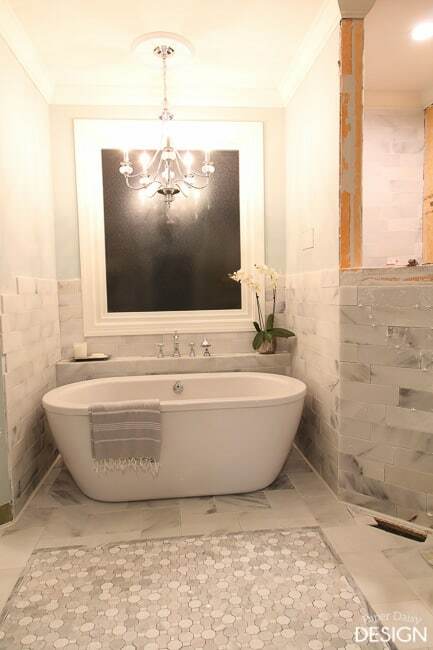 I love the tub area and I think your bathroom is going to be amazing when it’s done! Give yourself a day off and maybe even take a nap or sit and read some blogs or something for a bit! I will definitely be back for week 7! The room looks beautiful and your hard work is going to pay off! Ange, Would you believe that not only did I do laundry and make my home at least livable clean, I did in fact work on the bathroom. BUT I had a motive. I needed to grout the floors in our closets so we could move our things back in! So it was worth it! Thanks and hope you come back. I need to go check out your bathroom! I’ll be checking back for sure and well done you on doing this much already!!! 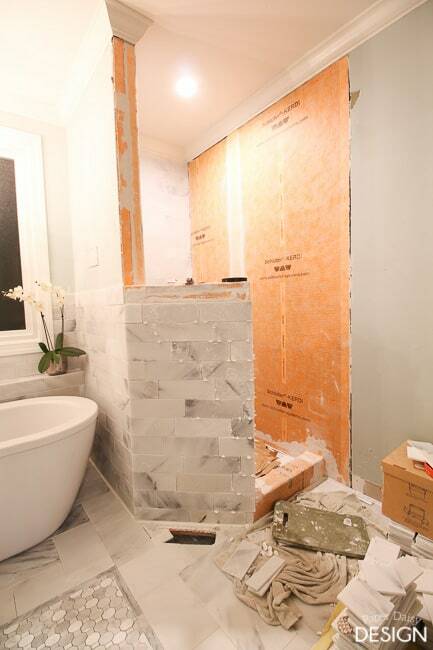 Your bathroom is very obviously going to be stunning. 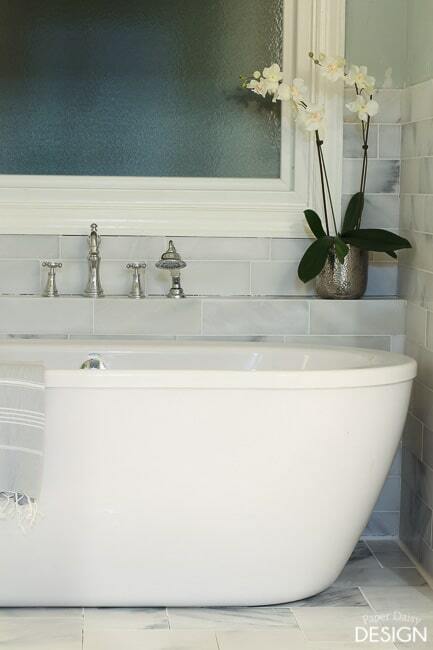 That tile is perfection and I love a free standing tub! Beautiful job! 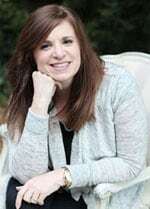 Christine, Thanks so much for commenting. I look forward to enjoying that tub, not going to lie. Hope to see you back. I can’t wait to see your room too! 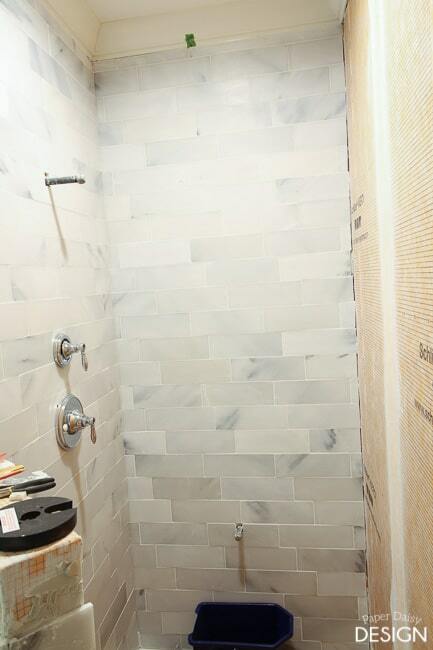 I am loving all the tile work and the walk-in shower. Kudos to you for installing the tile yourself and I look forward to seeing your finished product. Thanks! I do hope you return to see the final product. We did a great deal of planning for the shower. Wait until you see the back side of the pony wall! This is looking so beautiful! Great job, it’s impressive that you are doing all of the tile work yourselves. You are definitely going to earn a nice soak in that tub. It will be so worth it! Kelly, I can not wait to soak in the tub. Hopefully by Monday night! The plumber will be back to set the drains and that thing will be calling my name! Thank you for commenting. Be sure to come back! Progress is progress and what you have so far is stunning! Thank you! I keep reminding myself when I get discouraged that it will be great when it’s done! Slow and methodical is a GOOD THING! What beautiful progress you have made, and honestly, you are so smart to di it RIGHT rather than rush for what is a somewhat arbitrary deadline. I’m always so impressed by the people who take on kitchens and bathrooms. Isn’t it wonderful that the challenge pushed you this far? Can’t wait to see the final result. Next week or….whenever it is ready! Heather, thanks! I agree, kitchens and bathrooms are a tall order for this challenge. It’s funny how confident I was that we would finish. 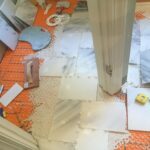 But at that point I really had no idea how long the tile was going to take and certainly didn’t anticipate the delays with the heated floor issues. 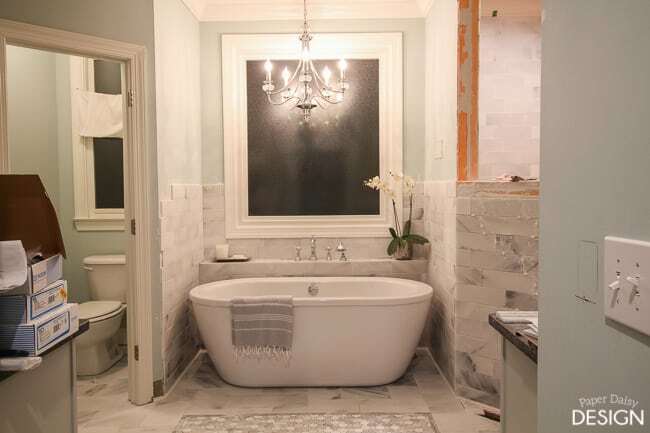 The tub area looks stunning. If that shows anything of what’s to come, you are going to have the most amazing bathroom. You took on such a huge project. I don’t think anyone could have done what you accomplished with such a short time-frame. Can’t wait to see the whole thing when it’s done. 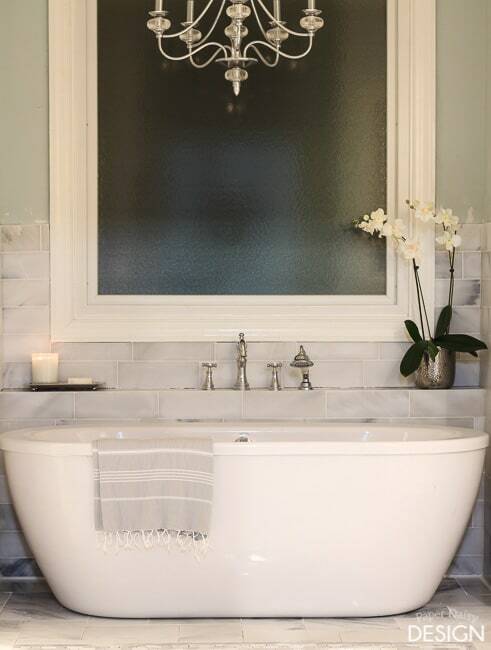 That tub is everything! And that tile! Gorgeous!! Haha! You can really see how beautiful your vision for the space is through the glimpse you shared first. Bathrooms are insane for ORC. I’m doing a closet next time. I’ll check out the work next friday- you got this! Girl….I always get scared when people attempt bath or kitchen renos for the ORC! There are just so many things that can delay the finish line….but what I see sure is pretty! Love the marble and that gorgeous tub. I will be back for the final reveal! Love this and am so impressed with the work you’ve done. It’s going to be fabulous! It is looking so amazing already! 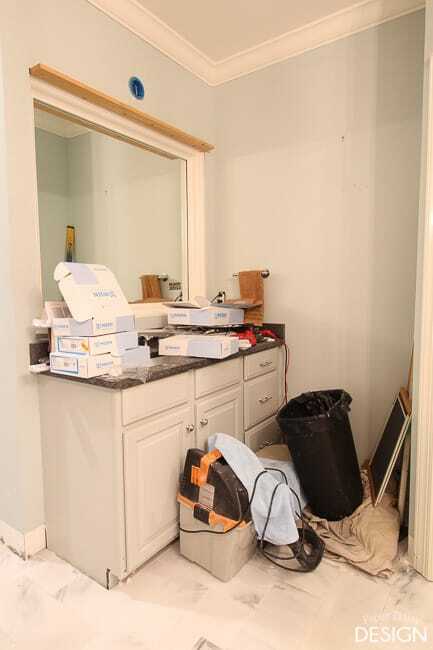 I will definitely be back for the full reveal, but I appreciate the reality check when it comes to doing bathrooms…my husband was gunning for a bathroom reno for this ORC and you’re making me very glad I passed. 🙂 Good luck this week! Can’t wait to see it. Oh sweetie, don’t be hard on yourself. You did an amazing job and look how far you got. Your choices are lovely and you are so close. It’s all good. If you want me to replace your finished link with this one, just let me know . You know you can always start earlier, next time. It is six weekly posts….any way you want to make that happen. Hope you have a lovely Thanksgiving.